UK and Ireland motorhome hire company, Bunk Campers, are currently waving off no fewer than 48 couples as they embark on a unique one-way motorhome touring holiday from the Weinsberg factory in Germany, with flights out and ferry crossings back all included as part of the deal. The annual Bunk Campers motorhome relocation trip, which this year takes place between the 19th–30th April, has become a necessary part of the campervan company's yearly business plan. The purchase of new models along with the inevitable scattering of Bunk Campers' fleet from previous travellers means, before the peak summer season hits, a vast number of their campers need relocating back to bases in the UK and Ireland. 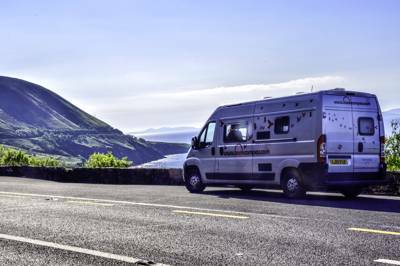 "Customers on the relocation deal have one week to ramble across Europe in their motorhome before returning to Bunk Campers depots in London, Edinburgh and Dublin", manager Leanne Cromie told Cool Camping. "This year will see a total of 96 people travel to the Weinsberg factory in the historic region of Bavaria as part of the low cost relocation deal which includes flights, transfers, motorhome hire and return ferry crossing." After all, why relocate the campervans at great cost when there are tonnes of happy campers out there hungry for such a great deal? The relocation trips also reflect the growth of Bunk Campers as a company and their need to expand their motorhome fleet in time for the campervan hire season. Since their launch in 2007, Bunk Campers have grown to be one of the largest campervan and motorhome rental companies in the UK and Ireland. The new 2017 model vehicles have been tailored by Bunk Campers specifically for British and Irish customers with right-hand drive, twin leisure batteries, reversing camera and on board GPS all fitted as standard. Compact but fully equipped vehicle types such as the 4 berth CaraBus 601MQH are well suited to the UK road network with options such as the CaraCompact 600MG or CaraLoft 650MFH proving great options for couples. The new Weinsberg models and a range of VW Campervans can be hired from Bunk Campers depots in Horsham (West Sussex), Edinburgh, Dublin and Belfast with further information on their Cool Camping web-page. This spring's relocation deals with Bunk Campers have now ended but you will find them, and other companies, shown on our dedicated campervan hire page. Keep an eye on our facebook and twitter pages for more last minute deals, special offers and campervan promotions throughout the coming year.